How Often Should a Person Water Zinnia Flowers? Zinnias are colorful annuals that bloom prolifically from spring to frost. It is easy to harvest zinnia seeds from your favorite plants and grow new plants. Seeds from hybrid zinnias will not produce the exact same type of plant, but will produce variations of the parent plants. Use garden snips to cut completely dried flower heads from healthy zinnia plants. You can also snap the flower head from the stem with your fingers. If you snap a flower head off, you should hear a “pop” if it is ready to harvest. Tear the flower heads apart over a piece of paper. Zinnia seeds are in the cone behind the petals. Check the base of the petals for attached seeds. The seeds look like fuzzy or furry tiny arrowheads. Separate the trash from the seeds by pouring the seeds from one cup to another in front of an electric fan. This will blow away the lighter debris. Spread the seeds out in a cool dry place until they are completely dried. Put the seeds in a paper bag. Place the bag and a tablespoon of silica or other desiccant in a container and close tightly. Store in the refrigerator until ready to plant. 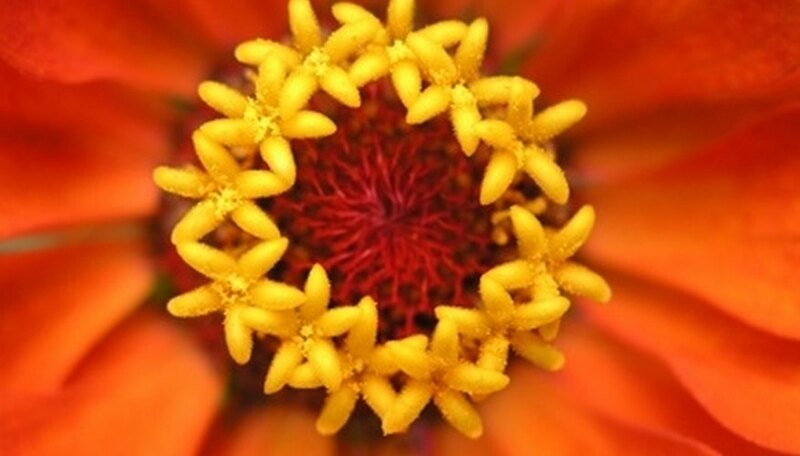 Place zinnia seeds or plants in a site that receives full sun -- at least six hours per day. If zinnias don't receive enough sunlight, they will grow leggy, flop over and bloom poorly. Make sure the plants are at least 12 inches apart so they receive good air circulation. Amend the soil with manure or well-rotted compost. While zinnias are not picky (they'll grow in almost anything), balanced, light soil will ensure good growth. Water your zinnia plants when the top 2 inches of soil is dry. Zinnias like hot weather; too much water or watering the plants from above can lead to mildew problems. Consider using a soaker hose to keep water near the roots. Pinch back zinnias when they are between 8 to 15 inches high, depending on whether they are dwarf or standard cultivars. This will encourage branching. Cut off dead blooms to spur new flowering. At the end of the season, leave the final blooms on the plants if you'd like your zinnias to reseed. Feed your zinnias with Osmocote, Miracle-Gro or another multipurpose 20-20-20 fertilizer once a month. Cut zinnia blooms in early morning before the heat of the day has time to wilt the stems and flowers. Choose blooms that are fully open or almost fully open with long stems. Use garden snips to cut the stems and put them in a bucket of water. Keep the cut flowers shaded since they tend to wilt in direct sun. Take the cut flowers to a cool place. Use garden snips to remove any leaves that will be under water and cut the stems again under running water. Return the flowers to the bucket of water and let them rest for several hours. Add floral preservative to the water in the vase or other container that you are using. Arrange the flowers as desired and set in a location out of direct sunlight or drafts. You should water a zinnia plant once or twice a week throughout dry times. Zinnia plants need at minimum 1 inch of water a week. Collect zinnia seeds from fully dried flowerheads from healthy plants. Use garden snips or your fingers to remove the flowerheads from the stems. A flowerhead that is ready to be harvested will “pop” when it is snapped from the stem. Crumble the flowerheads over a piece of paper to release the seeds from the cone behind the petals, and check for attached seeds at the bases of the petals. The seeds resemble tiny arrowheads with a light coating of fuzz or fur. Pour the seeds from 1 cup to another in front of an electric fan to separate the debris from the seeds. Spread the seeds to dry in a cool dark place. They should be completely dry within 1 to 2 weeks. Store the seeds in a paper bag and put the bag in a container with a lid. Add a tablespoon of silica or other desiccant to the container and close tightly. Keep in the refrigerator until you are ready to plant the seeds. Plant your zinnias in a full sun location that receives six or more hours of direct sunlight each day and offers well-draining soil. Plant your zinnias so that they sit at the same level that they were growing when in their nursery or garden center container. 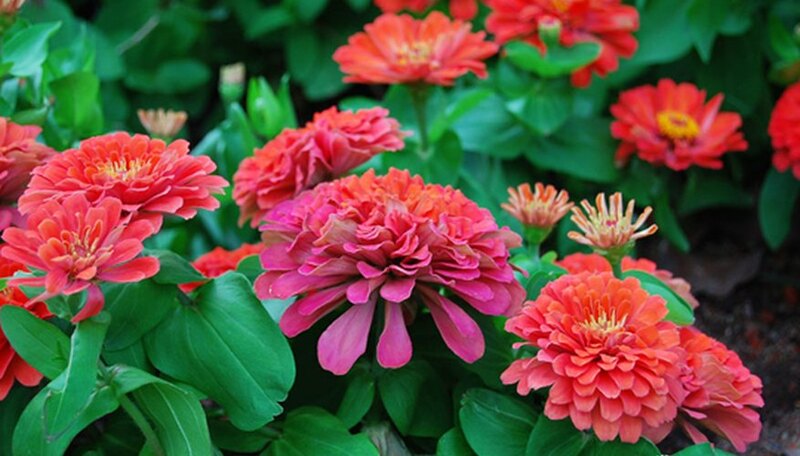 Water your zinnia flowers often and maintain moist but well-drained soil. Provide enough supplemental irrigation at each watering to soak the soil to a depth of 6 to 8 inches. Water at the base of your zinnias, rather than from overhead, to reduce the risk of foliage fungal diseases. Feed your zinnia flowers with a half-strength solution of a balanced, water soluble liquid flowering plant fertilizer every other week throughout the growing season. Follow the application instructions on the fertilizer product to ensure that your zinnias are receiving the correct amounts of nutrients. Pluck faded, dead blossoms from your zinnias throughout the growing season to maintain an attractive appearance. Pinch off spent blossoms to encourage your zinnias to focus their energies on producing additional gorgeous blooms. Leave the last blossoms of the growing season on your zinnias to encourage them to reseed in their current location. If you allow them to reseed, you can expect another beautiful batch of zinnia flowers the following spring. Ensure that your zinnias are growing in full sun. In order to get maximum blooms from each plant, they need a minimum of six hours of sun per day. Water the zinnia plant when the top inch of soil begins to dry. Snip off dead and dying flowers and remove them from the planting area. This will encourage the plant to produce more flowers. Cut the zinnias for fresh flower arrangements frequently. Removing flowers will cause the plant to produce more. Cut the flowers in the early morning and select zinnia blooms that are just beginning to open. Fertilize the zinnia plant every four to six weeks through late summer with a balanced water-soluble 20-20-20 fertilizer at the rate suggested on the label. Feeding the plant forces it to bloom.